Lately we have felt a big surge to go to Morocco. The other day we briefly met two likeminded travelers, we didn’t exchange many words but surfed together for a while. Later they made a comment on our instagram and now we follow one another. They have a blog called PVTNDL and it’s pretty darn good, you should check them out and follow their instagram to. PVTNDL (PIVƏT NĒDL): A FRICTIONLESS, MAGNETIZED NEEDLE ON A PIVOT, ALSO REFERRED TO AS A COMPASS. Just check these instaimages out from their Moroccan travels. So keen to go!! It’s amazing how meeting people and friends is not limited to eye to eye conversations. You can meet someone, not know them so much and then keep contact and get to know some one really well online. Love it. We also stumbled upon Explora that reached out to us on email. They seem to be a pretty cool surf school and they are based in Essaouira. That’s where Cailin is going to have another yoga retreat this spring! Her Moroccan retreat also looks amazing. Step into the magic of Morocco on this luxury retreat! Peacock Pavilions (awarded ‘Certificate of Excellence’ and ‘Travelers Choice’ by TripAdvisor two years in a row! Featured in Elle, Vogue, and Harpers Bazaar) is located on the outskirts of Marrakech. Practice yoga in the outdoor tented pavilion twice daily, and relax with afternoon meditations. Enjoy three amazing meals a day in the exotic Arabian dining tent, and sleep in style in the beautiful rooms that are fit for royalty. Excursions include a day trip to seaside town of Essaouira for some exploration and camel riding on the beach, belly dancing and dinner in town, trips to the market in Marrakech for shopping and sight-seeing, Moroccan cooking lesson at famed cooking school, an afternoon soak and scrub at the Hammam, and a rooftop henna party! Includes signature “Moroccan Rose” pedicure. Round-trip airport transport included. 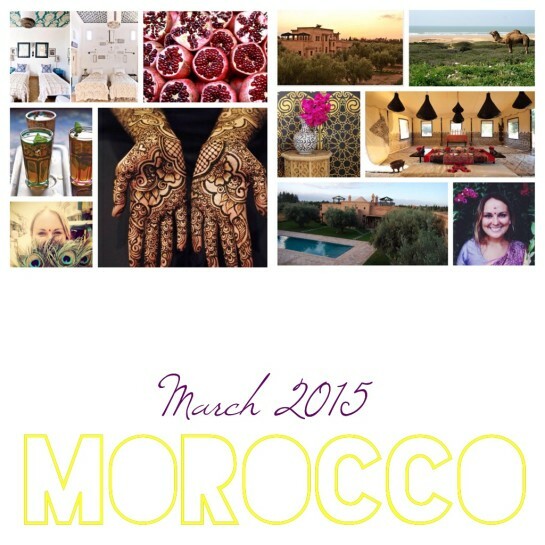 The retreat is March 21 – March 28, check Cailins website for more info on her Morocco yoga retreat.